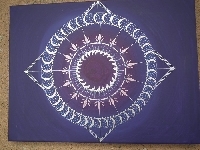 For 2013, I am hosting a mandala series, one a month for the year. Join in on all or one: it's up to you. The word "mandala" simple means "circle". They are traditionally a contemplative piece, meant to be used as an object of meditation. I am keeping the definition loose, so as to allow your artist's heart latitude in the creative process. A mandala should be roughly circular within the format below. Other than a recognizably circular shape, it is all up to you and your creative heart. Please go to the Flickr site above and see mandalas: also look at the comments. My November Mandala is there, with a comment from someone who does not consider it a mandala. For the purposes of this series of swaps, it would be defined as a mandala because of its circular, symmetrical format. However, mandalas do not have to be symmetrical in design: see the link for zentangled mandalas, where designs within a circle aren't symmetrical. Also, rangoli is acceptable. Hope this is clear -- and loose -- enough for all of you to draw to your heart's content!!! In order to possibly bind the mandalas into a year-book, please make the format 7" X 6" sturdy paper. Make the mandala on the rightmost 6" X 6" area, leaving the leftmost inch as the area to bind it into a book. Please use sturdy, at least 65# paper (at least cardstock weight). You may draw, paint, collage, zentangle your mandala. Those of you who can, please post your mandalas in the Flickr group -- the link is above on swap homepage. I've had questions regarding using printed mandalas. I think that a printed string would be acceptable, to tangle, but not a printed mandala that you color. Please check with your partner. Also, I've had mandalas sent to me in incorrect format -- on paper too light, and with no space allowed for the leftmost inch, to bind into a book. I've not rated these down... so far. PLEASE remember to use the right format. You risk a 3 if your partner is strict. I'll check profiles and reserve the right to ban at my discretion. I will angel but I hope it will not be necessary. Don't get hung up on definitions, but DO get hung up on making something beautiful. I think you'll know when you've done so.